Like age, there has been a decline in work for all educational categories. The employment rate for native high school dropouts, high school graduates, those with some college, and those with at least a bachelor's degree declined from 2000 to 2007 and from 2007 to 2013. The number of adult natives with no more than high school education not working is 4.9 million larger in 2013 than in 2000, the number with some college not working is up 6.8 million, and the number with at least a bachelor's degree not working is up 3.8 million. This analysis examines employment trends for immigrants and natives using the "household survey", collected by the government. The survey, referred to as the Current Population Survey (CPS), is the nation's primary source of information on the labor market.1 This report follows the Census Bureau definition of immigrants, normally referred to as the foreign-born. Immigrants (the foreign-born) are those who are not U.S. citizens at birth and include naturalized citizens, Lawful Permanent Residents, temporary workers, foreign students, and illegal immigrants. We concentrate on the first quarter of each year 2000 to 2013 because comparing the same quarter over time controls for seasonality and the first quarter of 2013 is the most recent quarterly data available. 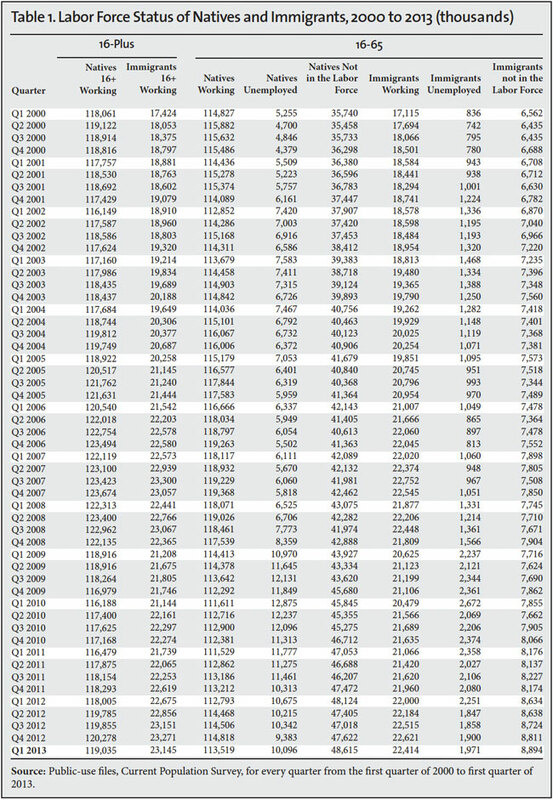 However, in Table 1 we report employment figures for immigrants and natives for every quarter 2000 to 2013. 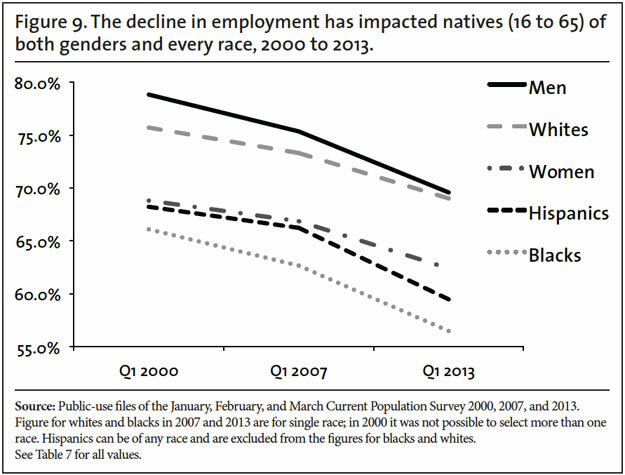 The same decline in work for natives exists regardless of the quarters compared. The only age group that has seen an improvement in their employment situation is those over age 60, especially those over 65. Table 1 reports employment for those 16 to 65 along with employment for all workers, including those over age 65. As discussed above, comparing the first quarter of 2000 to the same quarter in 2013 for the working age (16 to 65), shows that there was a 1.3 million decline in the number of natives working. However, looking at all workers 16-plus, including those over 65, shows that these older workers did make small employment gains. As a result there were 974,000 more natives (16-plus) of all ages working in 2013 than in 2000. Over the same time period, the number of immigrants workers (16-plus) increased by 5.7 million. This means that 15 percent of employment gains went to natives when those over 65 are included. This is still a tiny share of employment growth since natives accounted for two-thirds of population growth for those 16 to 65 and almost all of population growth for those over 65. Other academic studies have also found that immigration reduces job opportunities for natives. In its 1997 study of California, the Rand Corporation concluded that in that state alone competition with immigrants for jobs caused between 128,200 and 194,000 native-born workers in the state to withdraw from the workforce.6 A more recent analysis by Federal Reserve economist Christopher Smith found that immigration reduces the employment of U.S.-born teenagers.7 This is consistent with work by Andrew Sum, Harrington, and Khatiwada showing that immigration has a significant negative impact on the employment of younger workers.8 The recently published Congressional Budget Office cost estimate for the Gang of Eight immigration bill (S.744), indicates that just the increases in legal immigration in the bill will increase unemployment by about 150,000 through the year 2020.9 Although there is evidence that immigration reduces employment opportunities for natives, there remains a debate among economists about the extent of the job displacement. Putting aside the research, the dramatic decline in work among natives, and the enormous increase in the number not working, even before the recession, is strong evidence that labor is not in short supply in the United States. Job Americans Don't Do? Part of the reason immigration is very likely to adversely impact the employment of natives is that, contrary to the assertion of some, the idea that immigrants only do jobs American do not want is mistaken. Of the 472 civilian occupations defined by the Department of Commerce, only six are majority immigrant (legal and illegal). These six occupations account for 1 percent of the total U.S. workforce. Many jobs often thought to be overwhelmingly immigrant (legal and illegal) are in fact majority native-born. For example, 51 percent of maids and housekeepers are U.S.-born, as are 63 percent of butchers and meat processors. It is also the case that 64 percent of grounds maintenance workers are U.S.-born, as are 66 percent of construction laborers and 73 percent of janitors.10 It is simply not the case that there are jobs that Americans do not do. New Arrivals. The Center for Immigration Studies and other researchers have found that the level of new immigration is below the record levels it was a decade ago.11 However, the nation's immigration system continues to bring in a very large number of legal immigrants and new illegal immigrants continue to arrive, though in lower numbers. The CPS shows 5.44 million new immigrants (legal and illegal) of all ages arrived in the United States from the first quarter of 2008 to the first quarter of 2013. This implies about 1.1 million annual arrivals over the five years prior to the start of 2013.12 The monthly CPS from the first quarter of 2007, the peak of the last expansion, showed 6.56 million arrivals from the first quarter of 2002 to the first quarter of 2007, or 1.3 million arrivals annually over that five year period. Thus, based on the CPS, during the worst economic slowdown in the last 75 years, immigration fell by 17 percent compared to the expansion from 2002-2006. None of these figures are adjusted to reflect those missed by the survey, so the actual number is almost certainly higher in both five-year periods. A 17 percent fall-off in new arrivals is not trivial, but it is not particularly large either. While the decline suggests that labor market conditions in the United States have an impact on the inflow of new immigrants, these results also indicate that the level of immigration does not fluctuate dramatically even under very different economic conditions. Put a different way, the United States remains a very attractive place for immigrants to settle even during a severe economic downturn. This fact coupled with the generous nature of America's legal immigration system helps explain why so many new immigrants arrived during and after the Great Recession. As expected, as the share not working has increased, the number not working has also increased for all educational groups. The number of natives with no more than high school education (18 to 65) not working is 4.9 million larger in 2013 than in 2000, the number with some college not working is up 6.8 million over this time period, and the number with at least a bachelor's degree not working is up 3.8 million. (See Table 5.) As is the case when examined by age, it is very difficult to find any evidence of a labor shortage, no matter what educational group is examined. Workers in their teens and 20s have seen their employment rates fall the most. For those in their 20s, this is true for all education levels. Even college graduates in their 20s have seen a significant decline in their rate of employment, a decline that was going on before the recession. (See Table 6.) This decline in work for those under age 30 is consistent with the possibility that immigration is playing an important role in reducing the employment of natives. Immigrants are new entrants into the labor market and most people begin their working life in their teens and 20s. One would expect that if immigration is reducing the job prospects of natives, then it would be most likely to impact younger workers. Older workers who are more established in the labor market are less likely to be impacted by new arrivals. In some ways, the decline in work among the young may be the most troubling because there is good evidence that not working when one is young has significant negative impacts on individuals in the long term. Research indicates that those who do not work in their youth often do not develop the skills and habits necessary to function well in the labor market, such as respecting authority, showing up on time, and following instructions. The very large decline in work among those under age 30 may have significant long-term negative consequences for those individuals as they age.14 The failure of young people to gain work experience earlier in their adult life may also have negative implications for the larger American society. Recent Employment Growth. 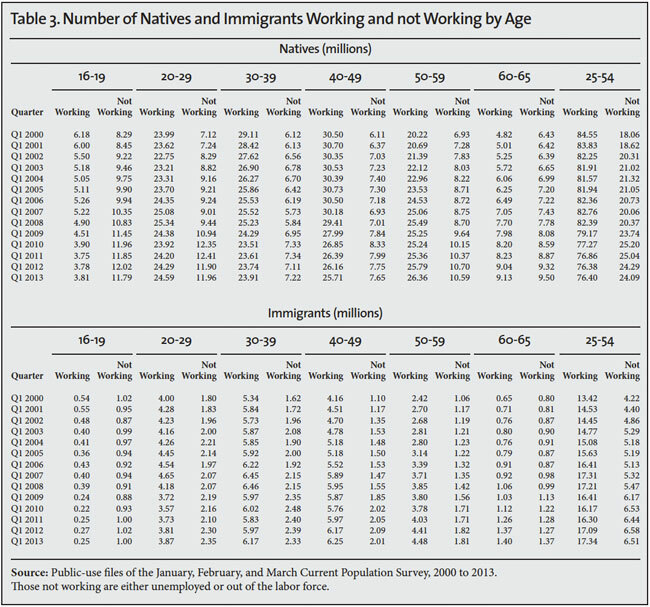 Taking the long view from 2000 to 2013 all of the net increase in the number of people working among the working-age has gone to immigrants, even though natives accounted for two-thirds of the increase in the overall size of the working-age population. However, more recently natives have done somewhat better. Since the job market started to recover, about half of the employment growth has gone to natives 16 to 65. Looking at the first quarter of 2010 compared to the first quarter of this year shows that the number of natives working has increased by 1.9 million and so has the number of immigrants working. Since immigrants account for 16 percent of workers it is still striking that half of employment growth has gone to the foreign-born. Moreover, the number of working-age natives not working has remained unchanged at 58.7 million because employment growth has barely kept pace with population growth among natives 16 to 65. The share of natives holding a job also barely improved. It was 65.5 percent in the first quarter of 2010 and it was 65.9 percent in the first quarter of this year — a mere 0.4 percentage-point increase. In contrast, the share of immigrants working has improved a good deal more, from 66 percent in 2010 to 67.4 percent in 2013 — a 1.4 percentage-point increase. (See Table 1 and Figure 6) This is simply no question that employment growth in the current recovery has been extremely weak, especially for natives. It would be a mistake to think that every job taken by an immigrant is a job lost by a native. But it would also be a mistake to think that dramatically increasing the supply of workers has no impact on the employment prospects of natives. The idea that there are jobs American's don't do is simply not supported by the data. Moreover, there is good research showing that immigrants displace natives from the labor market. Although the issue of native and immigrant job competition is not settled in the academic literature, there are several things we can say. First, and perhaps most important, the latest data do not support the argument that workers are in short supply in the United States. The decline in work among natives is very broad, impacting high school dropouts, those with a bachelor's degree, and every educational category in between. It has impacted workers of almost every age as well as men, women, blacks, whites, and Hispanics. Second, the decline in the share and number of natives working is consistent with the possibility that immigration is adversely impacting native employment, particularly the pronounced decline in work among the young who are new entrants into the job market. Third, the available evidence does not support the idea that large-scale immigration necessarily creates job opportunities for natives, as some have argued. 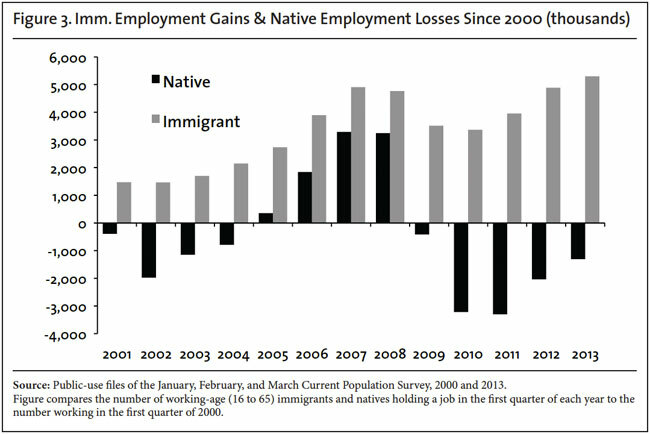 From the first quarter of 2000 to the first quarter of 2007, immigration levels were very high, yet the share of natives with a job actually fell. From 2008 to the start of 2013, an estimated 5.4 million new immigrants arrived, but job growth has been very weak during the recovery. The last 13 years, or even the last five years, make clear that large-scale immigration can go hand-in-hand with weak job growth and declining rates of work among the native-born. Given the employment situation in the country, the dramatic increases in legal immigration contemplated by the Gang of Eight immigration bill seem out of touch with the realities of the U.S. labor market. The two primary employment surveys collected by the United States Government are referred to as the "household survey" (also called The Current Population Survey or CPS) and the "establishment survey". The establishment survey asks employers about the number of workers they have. In contrast, the CPS asks people at their place of residence if they are working. While the two surveys show the same general trends, the figures from the two surveys do differ to some extent. The survey excludes those in prisons, nursing homes and other institutions. 1 We do not use the "establishment survey", which measures employment by asking businesses because that survey does not ask if an employee is an immigrant. 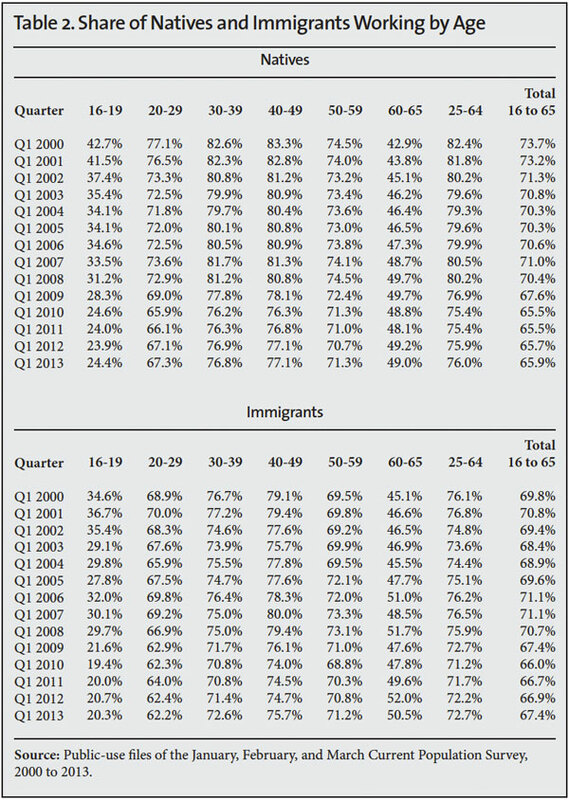 2 Table 1 reports employment for working-age (16 to 65) immigrants and natives for every quarter since 2000. It also reports the number of workers 16-plus holding a job. Comparing the first quarter of 2000 to the same quarter in 2013 for the working-age population shows that all of the employment growth has gone to immigrants. 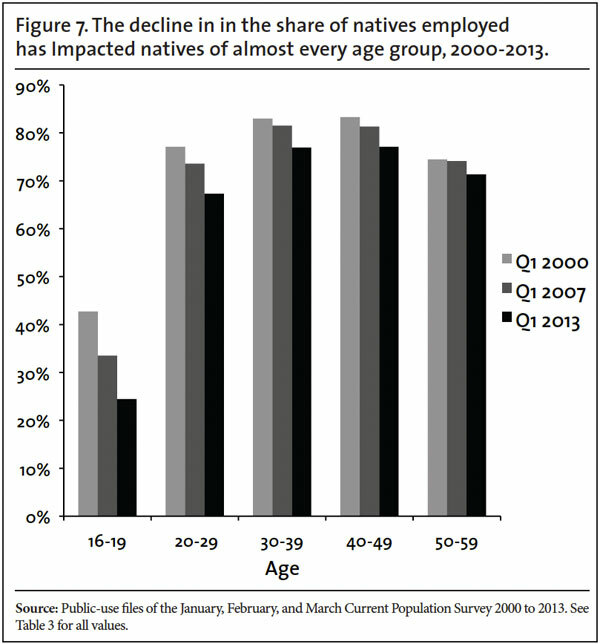 However, looking at all workers 16-plus shows that natives over age 65 did make small employment gains. As a result, there are 974,000 more natives of all ages working in 2013 than in 2000. The employment gains for immigrants are 5.7 million, so looking at all workers shows that just 15 percent of employment growth went to natives. 3 George J Borjas, Jeffrey Grogger, and Gordon H. Hanson, "Immigration and the economic status of black men", Economica 77, pp. 255-282, 2010. 4 Edward S. Shihadeh and Raymond E. Barranco, "Latino Employment and Black Violence: The Unintended Consequence of U.S. Immigration Policy", Social Forces, Vol. 88, No. 3, pp. 1,393-1,420, March 2010. 5 Augustine J . Kposowa, "The Impact of Immigration on Unemployment and Earnings Among Racial Minorities in the United Statess", Racial and Ethnic Studies, Vol. 18, 1995. 6 Kevin F. McCarthy and Georges Vernez, "Immigration in a Changing Economy: California's Experience", Rand Corporation, 1997. 7 Christopher L. Smith, "The Impact of Low-Skilled Immigration on the Youth Labor Market", Journal of Labor Economics, Vol. 30, No. 1, pp. 55-89, January 2012. 8 Andrew Sum, Paul Harrington, and Ishwar Khatiwada, "The Impact of New Immigrants on Young Native-Born Workers, 2000-2005", Center for Immigration Studies, September 2006. 9 The CBO states that the increase in legal immigration forecasted as a result of S.744 would increase unemployment by .1 percent or 150,000 in a labor force of 150 million. See page 9-10 of CBO report: "The Economic Impact of S. 744, the Border Security, Economic Opportunity, and Immigration Modernization Act", 2013. 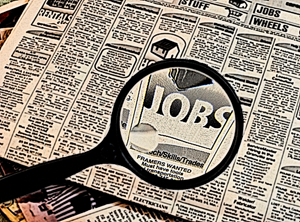 10 See Steven Camarota and Karen Zeigler, "Are There Really Jobs Americans Won't Do? A detailed look at immigrant and native employment across occupations", Center for Immigration Studies, May, 2013. 11 Steven A. Camarota and Karen Zeigler, "A Shifting Tide: Recent Trends in the Illegal Immigrant Population", Center for Immigration Studies, July 2009. Steven A. Camarota and Karen Zeigler, "Homeward Bound: Recent Immigration Enforcement and the Decline in the Illegal Alien Population", Center for immigration Studies, July 2008. Jeffrey Passel, D'Vera Cohn and Ana Gonzalez-Barrera, "Net Migration from Mexico Falls to Zero—and Perhaps Less", Pew Hispanic Center, April 23, 2012. See Table 3 in Micheal Hoefer, Nancy Rytina and Bryan Baker, "Estimates of the Unauthorized Immigrant Population Residing in the United States: January 2011", DHS Office of Immigration Statistics, March 2012. 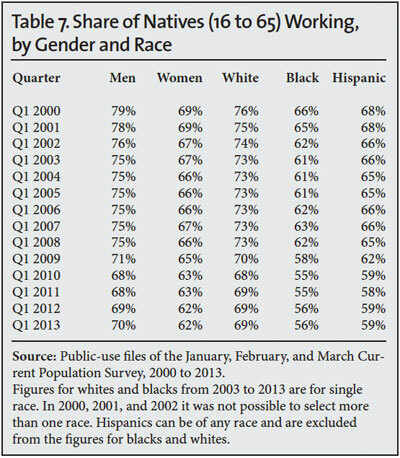 12 This is figure is from the public-use file of the Current Population Surveys for January, February, and March 2013. The survey asks immigrants when they came to the United States. The figure includes both legal and illegal immigrants. 13 The situation for those over age 50 is somewhat different than for younger workers. Table 2 does show a decline in the share working for 50- to 59-year-olds. But the overall number of natives 50 to 59 increased a good deal as did the number of natives in the 60- to 65-age range. This reflects the aging of the baby boom generation. From 2000 to 2013, the share of those in their 50s working fell even though the number with a job increased. Employment growth did not keep up with population growth for this age group so the share working declined. Those 60- to 65-year-olds did see their employment rate rise, unlike every other age group. For these individuals employment did keep up with population growth, though it is still the case that the number of 60- to 65-year-olds without a job went up by 3.1 million from 2000 to 2013. 14 For a review of this literature see pp. 4-5 in "Immigration and the Long-Term Decline in Employment Among U.S.-Born Teenagers", Center for Immigration Studies, May 2010. 15 For each quarter the CPS includes roughly 355,000 natives and 44,000 immigrants. The survey is then weighted to reflect the actual size of the U.S. population.